Sip local: April is #BCWineMonth! Did you know that BC has the highest proportion of female farmers in Canada? Alexis Warmerdam is one of these women and she is changing the face of farming in BC. Born and raised in Abbotsford, Alexis is a fourth-generation farmer on her family's cut flower farm, Lakeland Flowers. 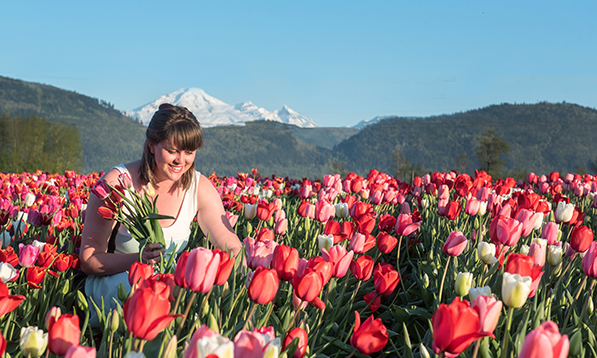 You might be familiar with the Abbotsford Bloom Tulip Festival which Alexis founded in 2016. She is also the current chair of BC Young Farmers, a committee of the BC Agriculture Council. We caught up with Alexis just a few days after Mother’s Day, one of the busiest times of the year for a BC flower grower. Can you describe your farm for our readers? AW: We grow cut flowers for wholesale distribution on our farm located between Abbotsford and Chilliwack. We have tulips in the greenhouse and outside in the field, we have daffodils, (more) tulips, peonies, as well as gladiolus. Our customers are mainly chain stores - Safeway, Thrifty Foods - and (we also sell) indirectly through wholesalers such as Costco and Real Canadian Superstore. In the United States, we send a lot of (flowers) to Trader Joe’s. Our flowers can be found throughout Western Canada and the US. So, the tulips you’re buying from supermarkets such as Safeway are very much locally grown. Will you share a little bit of your story with us? What inspired you to go into farming? AW: I actually started out studying engineering. I swore I wasn’t going to work for my dad, but about 6 months before I graduated there was an opportunity to work on the farm. I thought I would work for one year and see if I liked it, and if I didn’t, I could always go back to engineering…and here we are, over four years later! I’ve been able to start my own tulip festival and even more opportunities have sprung up as a result. I’m just really enjoying where we’re at, and I don’t plan on going back to engineering in the near future. What’s next now that Mother’s Day is over? AW: Peonies is our next busy season. We’re on day 3 of picking peonies, and it’s a 2-3 week season. This year we’ll harvest a million stems of peonies (hopefully…if they all fit in the barn!). Did you know that BC has the highest proportion of female farmers? Are you seeing a shift in mindset around women in agriculture? AW: I think it’s fantastic that there’s more women in agriculture. Yes, there is a shift here. You can see it in the conferences I attend, in the statistics and if you look at who is representing agriculture on industry boards. It is great to see more women are getting involved in farming, be it in the day-to-day operations on the farm or working at the industry level on boards and committees. The number of female directors on BC Young Farmers (BCYF) is growing. Women in agriculture are not only interested in working on the farm but being engaged in the farming community and supporting others. Being involved with BCYF is a great way to accomplish both of those goals. Did you know that BC has the highest proportion of female farmers in Canada? How can women be more involved in farming? AW: There are many ways women can be involved in farming. Women tend to be great communicators. Today, when public trust is such a significant conversation, and sharing the core values of farmers is so vital to the future of farming, I think women can have a large impact telling their story in a way that can connect with the end consumer. What are the best ways for consumers to support young farmers in BC? AW: Buying local - buying BC and/or Canadian products whenever possible is a way of supporting young farmers. Also, when you hear about events or open houses at farms - attend those and ask questions. There are farmers old and young that are excited to talk to consumers, they’re proud to talk about their product. I’m proud of what I grow and I’m happy to tell people about it. The Abbotsford Bloom Tulip Festival is one way I've been able to share what I do as a farmer with the public and generate additional income. Whether it’s a corn maze, pumpkin patch, tulip festival, or going to a U-pick strawberry farm - while they’re great things to do with your family, you’re also supporting local farmers, big time. BC’s flower growers want to celebrate you for picking local and are giving you the chance to win beautiful BC grown flowers for a year! To enter, head over to their Facebook page for entry requirements. Contest closes June 25th.